New England has lost another major bank headquarters. TD Bank quietly dropped Portland, Maine, as its base this past summer, giving up lighthouses and lobster rolls for the affluent suburb of Cherry Hill, N.J., about a half-hour’s commute from Philadelphia. 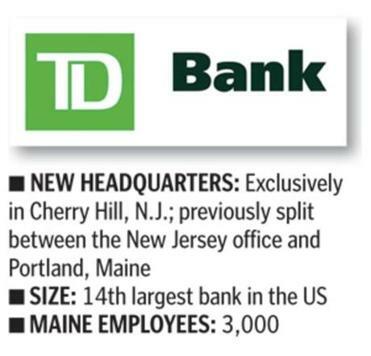 Following its 2008 merger with Commerce Bank, which was based in Cherry Hill, TD kept dual headquarters in Maine and New Jersey. But the bank has grown and expanded further south along the Atlantic Coast, and New Jersey became a more central location for its headquarters, said spokeswoman Rebecca Acevedo. Additionally, she said, most of the bank’s core corporate staff work out of Cherry Hill offices, including the company’s chief executive Mike Pedersen, who lives in Philadelphia. “It makes sense,” Acevedo said. TD’s parent company, Canadian financial services giant Toronto-Dominion Bank, broke into the US market in 2004 with its acquisition of Portland-based Banknorth, which traced its Maine lineage back to 1852. The new institution was called TD Banknorth. Then in 2008,Toronto-Dominion bought Commerce Bank for $8.6 billion and united its US institutions under the TD Bank brand. TD Bank is the 14th largest bank in the country with nearly $229 billion in assets and 1,300 locations. Acevedo said TD remains committed to Maine. The bank still employs more than 3,000 workers in Maine, and the state is a hub for TD’s back-office operations, including a call center. As long as the jobs remain in Maine, said Chris Hall, chief executive of the Portland Regional Chamber of Commerce, he isn’t too worried about losing the headquarters distinction. Some cities enjoy bragging about the number of Fortune 500 companies based in their communities, but Portland is more laid back, Hall said. There are no Fortune 500 companies in Maine. This isn’t the first time a company has grown and moved its corporate base out of Maine, Hall said. Insurance firm Unum started in Portland but after it merged with Provident Life and Accident Insurance Co. of Chattanooga, it moved its headquarters to Tennessee. “Nothing ever stays in one place,” Hall said.